I was quite pleasantly surprised by Say Her Name by James Dawson. I'll admit, I did go into this book hoping that it would scare the pants off me and while it didn't quite reach that level for me, I did find Say Her Name consistently and, at times, uncomfortably creepy. I loved that there was this thread of unease that really built up throughout the story and that there felt like quite a bit of tension. Plus? I absolutely love the cover. 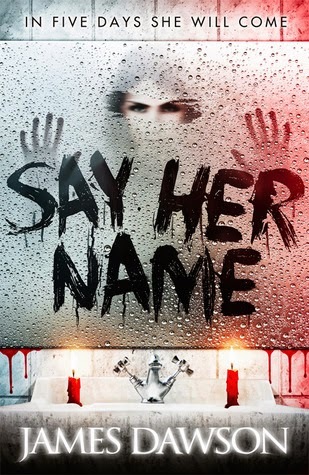 Say Her Name is the story of Bloody Mary and how the legend of this ghost manifests itself in the lives of a group of teenagers at a boarding school. It all starts off as a bit of a joke at a Halloween party, when our main character, Bobbie, her room mate, Naya, and a local boy, Caine, end up in front of a mirror invoking Bloody Mary's name. Nothing happens immediately however, unfortunately for the three characters in Say Her Name, that isn't where the story ends. Things start happening. Nightmares, scary reflections in mirrors ...and then more. There's a race against time for these three characters to find out what they can about Mary and this curse in order to save themselves. I think my favourite aspect of this story is how much I came to care about the characters. Bobbie is a wonderful main character. I think she's funny and witty and has the best dialogue throughout the story. I liked her relationship with her room mate, Naya, and how they interacted with each other. And I also really liked Caine as a love interest, especially with how lacking in confidence Bobbie is to believe anything could happen. But I think the thing I loved the most is what these three characters come to find out, in their search for answers, about Mary's past and how this curse came about. I think it could have been quite easy to not give Mary a back story but I found myself feeling a little bit sorry for Mary's character and I think that made this story a lot more interesting for me. It also had lots of elements of scariness and horror. I did read parts of this book late at night, in bed, alone and I found myself succumbing to some of the creepiness, especially with the elements of water and reflections. My only complaint with the book is that I would have liked the ending to have gone in a different direction. I felt like the conclusion of the book took something away from what the author did with the Mary's back story and motivation. Thanks, Jesse. Yes, definitely creepy rather than scary and definitely in a good way :) I'm glad you enjoyed it as well! I've been wanting to read this for ages but was worried it might be too scary for me (I'm SUCH a wimp these days LOL) but you've convinced me to give it a try :o) Fab review! Just as a heads up you might want to check the British Books Challenge post when it goes up tomorrow!